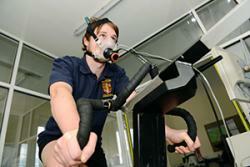 Participants were asked to cycle to a point of exhaustion. In the research using 13 physically active individuals, the researchers found that participants took three minutes longer to reach exhaustion, when subliminally shown happy faces as opposed to sad faces while they were instructed to cycle for as long as possible. This finding was replicated, but with words replacing the images. The participants again took longer to reach their point of exhaustion when subliminally shown action-related words such as “GO” compared to inactive words such as “STOP”. This recently published research in Frontiers in Human Neuroscience illustrates the extent to which the mind and psychological factors can effect an individual’s exercise performance. “These are exciting results. Our findings add to the emerging evidence regarding the mind’s influential role on endurance as well as the research investigating the role of non-conscious cues on behaviour. As far as our study is concerned, one way of understanding these results is that the primes seemingly reduce how effortful the exercise task felt, which in turn meant that the participants could keep going for longer.